The Navajo Code Talkers were a group of about 400 native Americans from the Navajo tribe (Diné) of New Mexico and Arizona who were trained by the Marine Corps as radiotelephone operators. The Code Talkers transmitted to each other in their native tongue, which they developed into a remarkably secure form of communication. 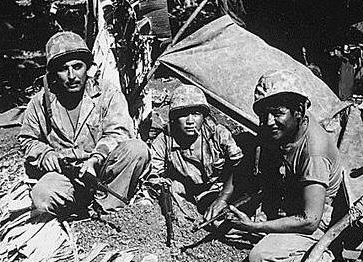 Code Talkers were first used in the Guadalcanal campaign and were subsequently assigned to every division, Raider battalion, and parachute battalion in the Corps. The Code Talkers were a success at secure communications in part because Navajo or Diné bizaad is an extremely complex language that lacks a written alphabet and is spoken only in a small area of the American Southwest. It is linguistically very distant from either Japanese or Western languages, and it was estimated that only 30 non-Navajos, none of whom were Japanese, understood Navajo in 1941. At the same time, the Navajo were one of the most numerous tribes of native Americans, making it possible to recruit a sufficient number of Navajo speakers. The Code Talkers did not speak to each other in plain Navajo. Rather, their communications were superencrypted. About 450 of the most frequently used military terms were represented by individual Navajo words, such as dah-he-tih-hi ("hummingbird") for "fighter aircraft." Other English words were spelled out by using Navajo words whose English equivalent began with the desired letter. Thus, the word "Navy" could be transmitted as tsah ("needle") wol-la-chee ("ant") ah-keh-di-glini ("victor") tsah-ah-dzoh ("yucca"). Since there were numerous ways to spell out an English word in this manner, the Navajo Code was a form of injective cypher, in which each element of the plaintext could be represented by a very large number of cyphertexts, increasing the security. A Navajo Code transmission sounded like a random hash of Navajo even to a native speaker, so use of the Navajo Code required considerable training. This was fortunate, as the Japanese somehow learned that the communications they were having so much trouble deciphering were in Navajo, but they were unable to break the superencryption even with the unwilling help of Navajo prisoners of war captured in the Philippines in 1942. The system was so valuable that it was kept secret even after the Japanese surrender, and saw use as late as the early Vietnam War era. The details of the program were not declassified until 1968, although it was very briefly mentioned in Morison's 1953 history of the Guam campaign (with no mention of the superencryption.) As a result, the Code Talkers received no formal public recognition from the U.S. government for their invaluable service until 1982.